I’ve been going to the Grand Canyon ever since I was a little girl! Doing the Rim to Rim hike is an unforgettable experience, but there are other ways to enjoy the Grand Canyon if you don’t want to do a 26-mile hike in one day too. Here’s our weekend getaway guide to the Grand Canyon! According to the National Park Service, all North Rim roads are closed. Hikers and cross country skiers will be able to enter the North Rim through the winter months with valid backcountry permits. The North Rim will open for the 2018 season on May 15, 2018. You can get to the Grand Canyon by driving from LA. It will take 8 hours if you’re trying to get to the Grand Canyon National Park or 6 hours if you want to head to the Skywalk. You can drive through Las Vegas and make a stop on the way or the way back. You can fly into Flagstaff airport which is about an hour drive from Grand Canyon National Park. Grand Canyon National Park Vehicle Permit- $30.00: Admits one single, private, non-commercial vehicle and all its passengers. Grand Canyon National Park Motorcycle Permit- $25.00: Admits one single, private, non-commercial motorcycle and its passenger(s). Grand Canyon National Park Individual Permit – $15.00/person: Admits one individual when entering by foot, bicycle, park shuttle bus, Grand Canyon Railway and private rafting trip. Individuals 15 years old and younger are admitted free of charge. This historic hotel is located at the South Rim inside of the Grand Canyon National Park. It is known as the the crown jewel of Historic National Park Lodges. It features a fine dining room, lounge, gift shop and newsstand with full bell service, a lobby concierge and in-room dining. This hotel is also located at the South Rim of the Grand Canyon National Park. It features a 250-room lodging complex nestled within several acres of Ponderosa pine forest, located just a short walk from the canyon’s edge! If you want to stay in a rustic cabin inside of the Grand Canyon National Park, now you can! Bright Angel has 90 lodging units ranging from cozy historic units with shared bath to standard lodge rooms, historic cabins to the one of a kind “Buckey O’Neill Cabin”. It’s located right at the top of the Bright Angel trailhead so you can go for a hike anytime! All these options are located at the South Rim of the Grand Canyon National Park. There are hotels outside of the park but do require a 20-60 minute drive. I recommend staying inside the park to minimize driving time! 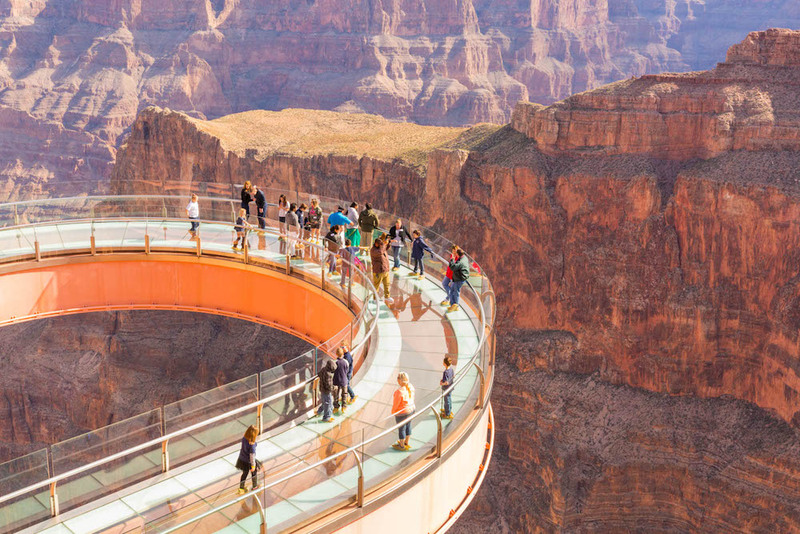 This Skywalk is located at the West Rim of the Grand Canyon and not inside the Grand Canyon National Park. It is a horseshoe-shaped cantilever bridge with a glass walkway near the Colorado River on the edge of a side canyon in the Grand Canyon. It is commissioned and owned by the Hualapai Indian tribe. Currently, tickets cost $84 to get access to the Skywalk which includes aticket to walk on the glass bridge, a meal at viewpoint of choice, official Hualapai visitation certificate and photo opportunities with Hualapai tribal members. Of course, this is my top choice of things to do at the Grand Canyon! To get to the Phantom Ranch (the campground at the bottom of the canyon) is approximately 7.3 miles down the south Kaibab Trail (which takes an average of 3-4 hours down) and 10.3 miles on the Bright Angel Trail (average hiking time down is 4-6 hours, average hiking time up is 6-10 hours). Summer temperatures can reach up to 120 F (49 degrees C) while winter conditions can be icy and treacherous, so make sure you’re fully prepared! You can also do the famed Rim to Rim hike, where you hike from one rim to the other in one day. I did it from the North Rim to the South Rim and it’s one of the best experiences I’ve ever had. It get’s really hot at the bottom of the canyon and it took over 15 hours, but it was really fun! Some do it in two days and camp overnight at Phantom Ranch, but it’s really hard to get reservations there. The Grand Canyon Railway was the lifeline to Grand Canyon National Park in the early 20th century. Passenger service to Grand Canyon National Park stopped in 1968, when traveling by car became more popular. The Grand Canyon Railway was reborn in 1989 when entrepreneurs brought the Grand Canyon’s train back to life. Today, the Grand Canyon Railway is owned and operated by Xanterra Parks & Resorts and carries about 200,000 people to Grand Canyon National Park each year. A big thanks to Buick for loaning me a Buick Enclave for this trip! This post is sponsored by Buick, but all opinions are my own.